The library at Trent Bridge has been renamed the Wynne-Thomas Library in honour of Nottinghamshire County Cricket Club’s long-serving historian, Peter Wynne-Thomas. The 81-year-old former architect has served at the Club since 1971, forming the library at Trent Bridge seven years later. 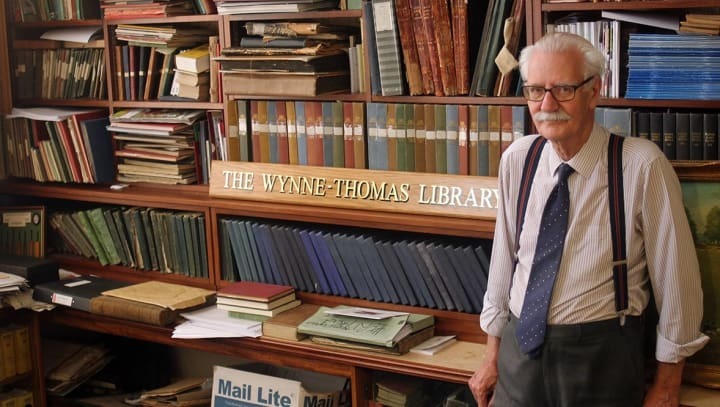 Boasting 15,000 books and in excess of 10,000 other items including letters, photographs, trophies and clothing, the library - under Wynne-Thomas’s stewardship - has grown to be the second largest collection of its kind in the world. Alongside his skills as an archivist, statistician, historian and librarian, Wynne-Thomas is also a successful author having penned 50 books. “What Peter does is amazing,” said Nottinghamshire Committee Member David Beaumont. “He is so unassuming, he doesn’t want any publicity, he just wants to get on with his job. “But, ask him about any cricketer and he’ll tell you their average, their date of birth and who he played for. Wynne-Thomas, although too modest to acknowledge his personal contribution to cricket in Nottinghamshire, admitted to being ‘very proud’ of the library. “It was just a collection of books that had been given to us in the 1970s when it started,” he said. “People kept donating books, it built up and up and up and has grown into the second largest cricket library in the world. In terms of books in one room, it is the largest. I never expected it to grow that fast. “There is a shelf for every country, a shelf for every county, two or three shelves on how to play cricket, two or three shelves on the novels that have been written about cricket - so it’s multi-purpose.